How Can I Check My Hearing? Home > Hearing > How Can I Check My Hearing? It is common to start to notice some decline in hearing as we get older but exposure to loud noise at work, playing loud music through headphones and some health problems and drugs can cause hearing damage. The best way to find out if you really do have hearing loss is to have a hearing test but many people just never get round to it. Might You Need to Check Your Hearing? Are you always asking people to repeat what they have just said? Are you always complaining that people mumble? Are you getting known for being the quiet one when you are in a group? Are you avoiding meeting up in noisy restaurants, pubs and shopping centres? Are you always in trouble for having the volume too high on the TV? Do you avoid making phone calls because you can’t hear the conversation? Does having a long chat with someone seem like a real effort? Have you stopped going out and meeting with people as often as you used to because you find it difficult to make out what people are saying? If this sounds like you but you don’t want to bother a doctor until you are sure that your hearing is a problem, why not take a phone or online hearing test to check out your hearing first? This will give you a very good indication of whether you need to then follow this up by seeking medical advice. A completely free hearing test is available from the RNID - the Royal National Institute for the Deaf. This is a phone hearing test that is available to anyone by calling 0844 800 3838. Although there is no charge, you have to pay for the phone call but if you call from a BT landline it’s only 5p a minute and it only takes a few minutes to do. You will hear a series of numbers being read out over some background noise. When prompted, you key in the numbers you have heard using the telephone keypad. The result at the end is instant and it will tell you which parts of your hearing are less than perfect. Online hearing tests are similar and are available on several sites – just type ‘hearing test’ into Google and choose one from a UK-based site. Remember that you will need a computer with speakers, which should provide stereo sound to be able to carry out some of the hearing tests properly. If you do have a problem, you can then see your GP who will refer you to a more thorough test by a trained audiologist. If you see an audiologist, you will have a hearing test in their consulting room, which should take less than half an hour. He or she will start by having a careful look at your ears – something that’s not possible in an online or phone test – you may have something as simple as a build up of wax that can be treated very easily. 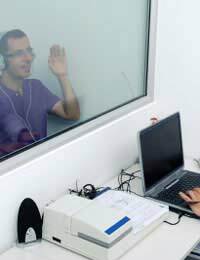 During the actual hearing test you will listen to sounds through headphones that will test which ones you can hear – you usually have to press a button when you hear something. This will test the range of sounds, both in terms of loudness and frequency, that you are able to hear. As we get older, we stop being able to hear high frequency sounds but if this loss is higher than normal, hearing problems can develop that make it difficult to make out what people are saying. You will be given a more thorough result chart showing more details about the quality of your hearing and your audiologist will discuss what it all means and refer you for further treatment if necessary. If you think your hearing has been damaged by using loud equipment at work and you are thinking about making some sort of claim, an online or phone test won’t hold up in court or be adequate for an investigation. You need a legally acceptable test and this can be arranged through either your solicitor or your GP.